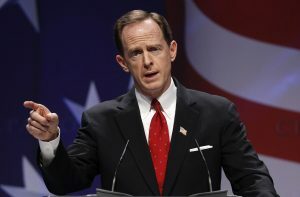 CARLISLE, Pa. — Freshman U.S. Sen. Pat Toomey is the rare conservative Republican who is running for re-election with the support of leading gun-control groups, but it may not be enough to save him in Democratic-leaning Pennsylvania in this unusual election year. Toomey, who also has separated himself from most of his GOP Senate colleagues by refusing to endorse Donald Trump, is facing questions from skeptical Republicans over his votes to expand background checks and prevent gun purchases by suspected terrorists as he campaigns in a state where Hillary Clinton leads Trump in polls by 10 points in the presidential race. His stance so angered one gun-rights group that it is backing his Democratic opponent, Katie McGinty, just to send a message to Toomey and any other Republican who might deviate from orthodoxy on guns. Toomey’s gamble — separating himself from his party and Trump — is drawing help from unlikely quarters for a Republican once endorsed by the National Rifle Association. In a blow to McGinty’s campaign, two prominent gun-control activists, billionaire Michael Bloomberg and former Democratic congresswoman Gabrielle Giffords, endorsed Toomey. Bloomberg’s political action committee even poured $4 million into Pennsylvania in recent weeks — primarily for TV ads — to support Toomey. For Toomey, it may help him with a Republican’s perennially thorny task of appealing to moderates in a state where Democrats outnumber Republicans 4-to-3. But it could hurt him with the Republican base in a passionate gun-rights state. Polls show the race is virtually tied, and the winner of the Nov. 8 election could tip control of the U.S. Senate. Some gun-rights activists say they will reluctantly vote for Toomey because McGinty supports a long slate of gun restrictions. Others are unsure whether to vote at all. “I have friends that are saying they are not going to vote for you because of your stance on gun control,” a meet-and-greet audience member, Mark Myers, told Toomey at a Carlisle restaurant last month. Stephen Mohr, a municipal Republican committeeman, said he found himself trying to talk hesitant gun owners into backing Toomey while manning a GOP booth at the Elizabethtown Fair in southcentral Pennsylvania a few days ago. On the campaign trail, Toomey says he doesn’t see a conflict between the right to own a gun and “a three-minute background check,” but also points to his 2010 NRA endorsement and his support for gun-rights causes. “Katie McGinty and the Democrats are attacking me all the time for all the votes I have cast consistently to make sure we don’t allow the Democrats to deny law-abiding citizens their Second Amendment rights,” Toomey told Myers. In an interview Friday, Toomey said gun-rights supporters who learn about his record are overwhelmingly supportive and that he believes he will draw votes from both sides of the issue. “The fact is, the vast majority of people, whatever they think of the Second Amendment, believe that background checks make sense,” Toomey said. McGinty portrays Toomey’s devotion to gun control as politically calculated and paper-thin, and rolled out her own endorsement from CeaseFire Pennsylvania. In recent elections, Democrats have largely steered clear of the gun issue, viewing it as a political loser because of the power of the NRA. This year, Clinton and others have made it a focus in the wake of mass shootings of civilians and police. Gun rights are no small matter in much of Pennsylvania: Even Toomey’s predecessor, Arlen Specter, a moderate Republican from Philadelphia, cast staunch gun-rights votes during his five terms in office. Christopher Nicholas, a Republican political consultant who worked on four Specter campaigns, said Toomey’s move to the middle on gun rights should win over more voters than he loses. If Toomey ultimately loses, it won’t be because of guns, Nicholas said. “It will be because of the Trump catastrophe,” Nicholas said. Gun rights activists viewed one bill that Toomey supported as an unnecessary expansion of background checks and another as potentially depriving people of their Second Amendment rights without due process. The NRA hasn’t rendered a verdict on Toomey in 2016. Pennsylvanians For Self Protection, a gun-rights group based in suburban Philadelphia, may not endorse Toomey, but will try to make it clear that he’s the “lesser of two evils,” president David Sager said. The Pittsburgh-area Firearms Owners Against Crime decided against endorsing either candidate after it endorsed Toomey in 2010, chairman Kim Stolfer said. “When you vote for the lesser of two evils, you’re still voting for evil,” Stolfer said. And the American Gun Owners Alliance, based in northeastern Pennsylvania, is encouraging its members to support McGinty, but not because they like her. If McGinty wins, she will be less powerful as a first-term senator than a second-term Toomey, and it will put the Republican Party on notice that candidates cannot cross gun-rights activists and win, founder David Dalton said.